Red truck loaner with a great big smile. Maybe it’s my imagination, but people in Florida just generally seem a lot nicer than in New Jersey. We recently stayed at a friend’s condo in a complex in Bradenton, which is on the west coast near Sarasota. Every time I drove through the development – at the required sedate speed of 15 miles per hour, enforced by periodic speed bumps – I would pass people walking their dogs or strolling along the side of the road. And they waved to me. It was a simple raised palm salute, accompanied by a smile, and pretty much everyone did it. At first I thought I was going too fast and they were giving me the “back off” sign, but if so why were they smiling? And where was the raised middle finger that normally punctuates that gesture in New Jersey? It seemed to be a genuine friendly wave. I shrugged it off as “retirement lifestyle” insanity, and lamely waved back. But then I went to the local Home Depot. I had compiled on my iPhone a list of odds and ends we needed – light bulbs, tape measure, WD-40, picture hooks, Philips screwdriver, all in different parts of the store. I was walking down the aisle peering at my notes and looking perplexed when a guy in one of those orange aprons walked up, cheerful as can be, and asked if he could help. I showed him the list and he promptly took me on a guided tour of the store, pointing out where everything I needed could be found. I stopped to grab a tape measure from an aisle display as he herded me toward Fasteners. He stopped cold. When he came back with my spray oil he explained the differences between the tape measures and suggested which one might be best for my needs. I felt like I was in Nordstrom’s with a fussy personal shopper, except this guy was selling me hardware instead of khaki pants. When I’m looking confused at my regular Home Depot back in New Jersey, the salespeople usually avert their eyes and act like they’re busy with something else. You have to get up in their face and demand help, and even then they treat you like the unpopular pimply kid at the junior high school dance. Again, I rationalized. This is the South, after all, where tools and fixin-up stuff is practically a religion. And it was a Tuesday morning – the guy had nothing better to do. Helping me was easier than stocking shelves, so what the hell. Then there was the kayak episode. We’d responded to a classified ad listing a used kayak for sale, and the owner had told us we could inspect it after he got home from work. We pulled up at the house, a typical white stucco ranch in a well-kept subdivision, and the kayak was already on the front lawn. The owner was about my age, thin and trim, with sparse gray hair and a relaxed, friendly demeanor. He wore the standard Florida uniform of sandals, t-shirt, and shorts. The kayak looked great and we quickly agreed to pay his asking price. But then there was the question of how to get it into our car, a smallish rented four-door sedan. It was obvious we couldn’t put an eight-foot kayak inside, and we didn’t have rope or bungee cords to tie it to the roof. We were going to have to make other arrangements to get the kayak to our condo eight miles away. “Want to take my truck?” he said. 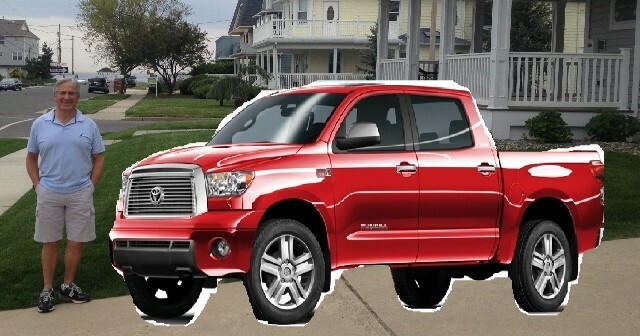 He indicated a bright red Toyota Tacoma pick-up in the driveway. He’d just been telling me how he and his wife had bought it a few months ago to tow their new 19-foot trailer, and he loved it. “Are you sure?” I asked, a bit taken aback. I’d only met the guy ten minutes ago. “Do you want to drive, and we’ll follow you?” Maria volunteered. Feeling awkward, I offered him the car keys for our rental vehicle which we had parked in his driveway. “In case someone comes home, and you have to move it,” I explained. But I was really offering a vehicle for vehicle hostage situation. He looked at me quizzically. “Ok, thanks,” he shrugged. Then he handed me his entire keychain, with not just the truck key but the keys to everything that locked in his life dangling from it, and walked calmly back into his house. As we settled into the front seat of this total stranger’s spanking new truck, Maria and I looked at each other and laughed. We weren’t in Kansas – or New Jersey – anymore.